This past weekend was spent in my husband's hometown for a wedding. We had a good time, but of course Sunday came to fast and now Monday is already upon us. Does anyone else just love food at weddings? Um...and free beer? I know I'm not the only one out there that enjoys it. My mom and her friends also judge a wedding by how good the cake is. Don't ask. I will say this weekend's cake was yummy! I only tried the pink version, which reminded me of jello poke cake, but I still have no idea what flavor it was...maybe raspberry? Regardless, it was so good that the husband took a plate "to go" style for the 5 block ride home. Yes, he has problems eating in the car, late at night, without utensils. So getting home yesterday, I had all intentions of going and doing my grocery shopping but that didn't happen. So today it is. I kind of have an unofficial rule that if we've been gone all weekend I don't cook that night when we get back. So dinner last night was a "fend for yourself" meal. The husband had eggs and I had oatmeal. I know, riveting, right? 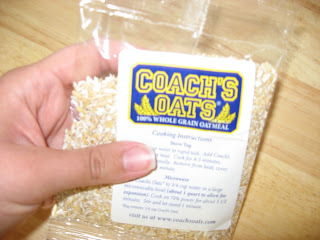 I had received a sample packet of Coach's Oats from Marla at Family Fresh Cooking awhile back, so I figured this was the perfect time to put it to use. She's having a giveaway by the way...check it out! Ever had steel cut oats? This was my first time, and they were good! So very creamy. 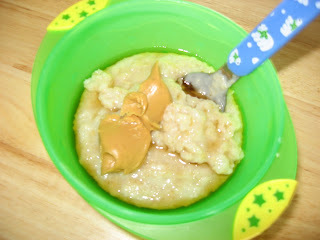 I mixed in a doll up of peanut butter and a swirl of maple syrup. It was the perfection combo. Apparently, I also don't do dishes before we leave town, therefore I'm eating out of a kiddie bowl with polar bear child's spoon. Well, I'm now off with little man to do some shopping. Check back later tonight as I'm making Inside Out Buffalo Hot Wings tonight for dinner! I do the same. If we've been away, I don't cook. usually stop at a grocery store and pick up something ready made, or throw a frozen pizza in the oven. After having fun/relaxing, who wants to cook and make a mess? I am with you on the wedding food! Love it! And I love steel cut oats! The childs plastic bowl and spoon is very classy! Im also a lover of wedding food! And eating with kids cultery! Love that you eat out of children's bowl...lol...we all do it!